As I mentioned in my last post I’ve had a Groupon for Mas Mexican Restaurant sitting around and about to expire this week. Today was the last day I could use it, but I actually ended up going on Monday and met my mom for dinner. When I showed up at about 4:40pm the sign over the front door was being painted, so I waited until afterwards to get a photo of the outside. When we went in there were a few tables filled but otherwise it was quite empty. There is a smallish, fully stocked bar which was devoid of customers but filled up about halfway fairly quickly. There was a good amount of staff milling around near the kitchen and waiting for the dinner rush. After us there was a very steady steam of customers coming in. Many must have been seated out in the patio area because it didn’t feel like it got much busier despite the consistent flow of people. The patio is enclosed with glass and covered by a roof (possibly a soft fabric roof, I didn’t go out and see it). Permanent gas heaters built in up above were keeping it nice and warm. We were seated up front in a booth against the window and given menus. Soon after, chips, salsa and bean dip was delivered. Our server came by and took our drink orders. This all happened in a short amount of time, but not quite a quickly as I might have expected given the level of business and amount of staff standing around. I ordered a Dr Pepper, which was quite good. Once we had ordered our food the servers pace seemed to pick up and she was very attentive throughout the rest of the visit. The chips we hot and fresh, and I had to stop myself before personally destroying the bean dip entirely. It was very cheesy and also nice and hot. The super-finely blended salsa was good, but was heavy on tomatoes which is not really my kind of salsa. My mom enjoyed it though. When I chose my entree, I was torn between the carnitas plate and the Chile Colorado (Chunks of beef are simmered for hours in a chile ancho and chile pasilla sauce. Tender and full of flavor. One of Mexico’s oldest recipes), which is what I ended up picking. As I’m now looking at the menu online I see something I missed and may have ordered if I hadn’t – Chile Rellenos (Battered chile poblano stuffed with beef picadillo, topped with chiplotle sauce and queso fresco). That sounds amazing and I think I might return soon to try it. My mom’s Chicken Avocado Salad (Fresh romaine lettuce, red onion and carrot topped with marinated grilled chicken breast, slices of avocado, tomatoes, and parmesan cheese) arrived along with my Chile Colorado. It was a gigantic salad with a good amount of chicken. She only made it about two-thirds through, but made sure to pick all the remaining chicken and avocado out before having them take it away. My Chile Colorado was seaming and smelled fantastic. The beef reminded me of Indian dishes in appearance and consistency. Guacamole was served along with sour cream, which was nice. It wasn’t the most amazing guac, but it sufficed. I received corn tortillas (flour is also available) and failed miserably in wrapping up some beef, beens and rice. I think next time in this situation I’ll order flour and see how it goes. I’ve always ordered corn and they just don’t hold up. I ended up ripping up a few remaining tortillas, spreading them over the beef and eating the rest with a fork, which my napkins thanked me for. Overall the Chile Colorado was pretty damn good. The beef was quite tender and the sauce was awesome and flavorful. The beans and rice were decent but nothing particularly special. I took half of the Chile Colorado home for lunch the next day (it was still pretty good reheated) so that I would have room for desert. I ordered tres leches (House-made moist cake enriched with three types of milk). This was absolutely incredible. Moist doesn’t really do it justice. Imagine soaking an already delicious and moist cake in a bowl of sweet milk for about an hour. The heavy whipped topping and chocolate drizzle were both a nice addition. I had considered ordering flan, but I’m glad I didn’t. This is something I’ll definitely come back for. I wish I was eating some right now. I only ate about half of it and took it for the next days lunch, along with the Chile Colorado, and it was still amazing. This was my first time at Mas and it certainly won’t be my last. Good service, chips, food, Dr Pepper and ridiculously good desert. I think next time I’d like to sit out on the patio, it looks nice. #47: Better Foods Deli, Inc.
I’ve driven by Better Foods Deli countless times all the while thinking it was a convenience store which had a tiny counter of a deli inside. Despite having “deli” in the name, that’s all I could imagine what I saw it from the street. Today I headed out aimlessly looking for lunch. I almost went to Mas Mexican to use a Groupon that expires this month but I decided to use it for dinner later this week instead to get more value out of it. Driving down Douglas the deli caught my eye. I mentally shrugged, thought “why not,” and made a U-turn. Parking is very limited in this tiny lot, but there was only one other car there when I arrived, and the driver of that car was leaving as I headed in. Again, I was still expecting to walk in to a convenience store with cramped aisles and a questionable deli counter in the back corner, so I was quite surprised when I stepped through the door. It truly is a proper deli. There are tables along the front and side walls. In the middle is the kitchen area and on the other side are coolers with bottled beverages. This place has been open for 42 years, and it shows with the amount of Giants/49ers memorabilia and classic Pepsi and Coke bottles that have accumulated. It actually makes Parker’s Hot Dogs collections look tiny in comparison. Towards the end of my lunch a man came in looking to buy or trade to acquire some of the bottles that were on display. The sole employee (maybe owner?) was behind the large refrigerated display case slicing meat when I walked in. 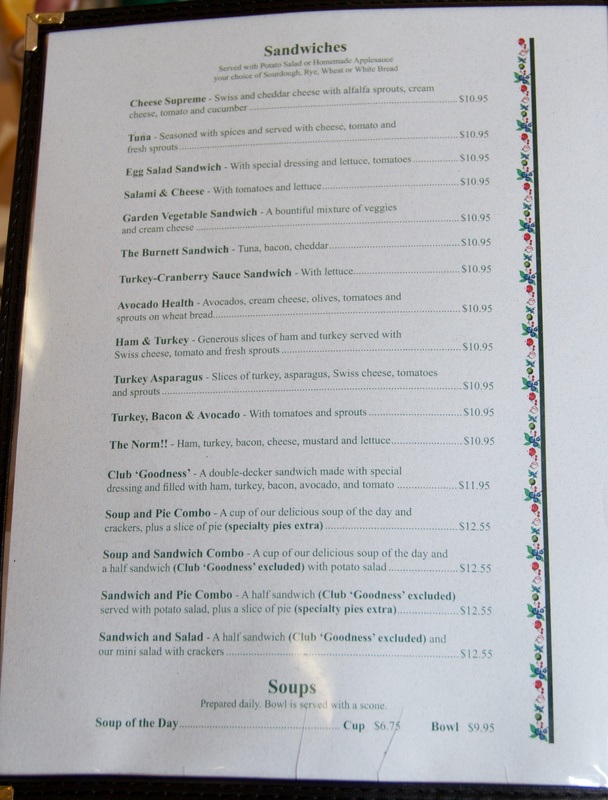 I spent some time looking over the menu and decided that a corned beef sandwich sounded pretty good. He finished slicing and came to the front to take my order, where he showed me the list of available breads, cheeses and the standard fixings, all hanging from the center of the larger menu. I went with a dutch crunch roll, the standard Monterey jack cheese, mayo, mustard, lettuce, tomatoes and onions. To drink I grabbed a Henry Weinhard’s Vanilla Cream soda from the cooler. While he made my sandwich I grabbed my other lens from the car (which I didn’t bring in since, once again, I thought I was walking into a convenience store and kind of expected to be taking my sandwich to go) and took a seat. Just a few minutes later I had my lunch in front of me. I don’t often drink cream soda because it can be so crazy sweet and isn’t always all that refreshing. Sometimes though, particularly in places like this, I get a hankering for one. This Henry Weinhard’s is definitely on the sweeter side. It was pretty strong overall and enjoyable. The corned beef sandwich really hit the spot. The beef was tasty and moist and the veggies were all fresh and crisp. I love a good dutch crunch roll. The Mr Pickles near my work has really good ones, especially when you show up early and they are fresh. This one was very good, soft throughout but with the crunchy top that adds so much fantastic texture. I’m really excited to have tried this deli. This is exactly the local, hold-in-the-wall type of place I hoped to find when I set out on this mission. I wonder who else has glanced at the front of Better Foods Deli and then moved along without realizing what they just passed up. If you’re in the mood for a sandwich I highly recommend you check them out. I’ve been looking forward to A Slice of Goodness since starting this mission. It was one of the first little places I started to notice that I had been driving past for years without paying any attention. Last Monday I had a good opportunity with the day off to get lunch here. They close at 2pm so during the week it’s not normally an option for me (yes, they are open on Saturday though). The front was slightly confusing because they share an entrance with the watch repair shop next door. The original doors are no longer used. Inside is a small hallway with a couple whiteboards listing specials for the day and is where you are greeted, then taken to your table. 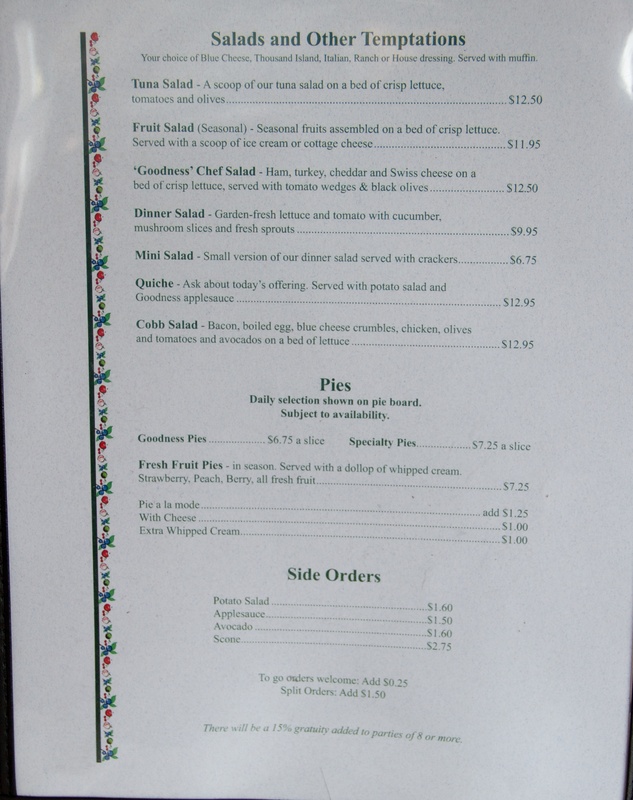 The lunch menu consists of sandwiches, soup, salad and of course pie. The turkey bacon avocado and the turkey asparagus both sounded pretty good. I had almost picked one of these when I saw The Burnett, which is tuna, bacon & cheddar. I haven’t had many tuna sandwiches, probably less than 5. 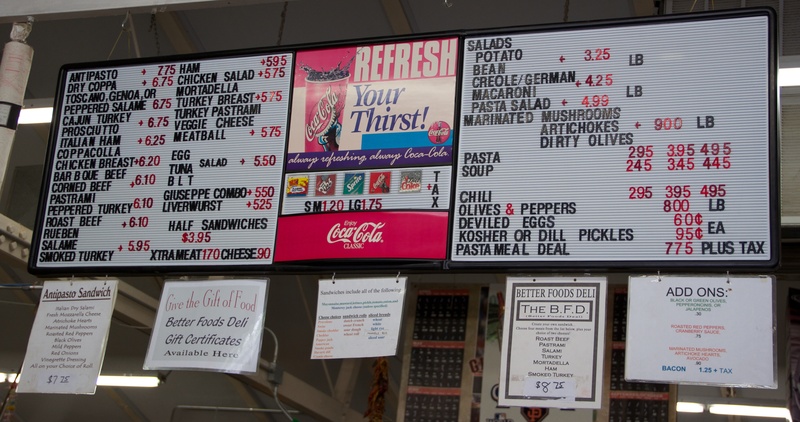 I didn’t grow up with them so I never think about them as a lunch option, but for whatever reason it sounded really good this day. I ordered it on rye bread. Other options were sourdough, white and wheat. Our server (who was all over the wall of photos) appeared to be the only one working the dining room that day, but he was on top of things the whole time and very friendly. He asked each one of us during our order if we would be having any pie. I wasn’t sure yet if I would want some or not, so I told him I might order a slice to go later. Although not listed on the menu, Dr Pepper was available and I ordered it as usual. It was a bit watered down and not very carbonated. It wasn’t bad enough to send back and try for something else though. My sandwich came out with a small scoop of potato salad, a small slice of watermelon, a slice of orange and a few grapes. Sometimes I’m in the mood for potato salad, and this must have been one of those times because I devoured it. I even went on to eat the watermelon, orange and grapes, which I would usually leave untouched. All three were tasty. All of our sandwiches came with sprouts, which we commented was nice since so many places seem to have done away with them. Other than sprouts and the other ingredients mentioned above, my sandwich also had tomato on it. The rye was soft and fresh, and went very well with the tuna. Each bite of bacon was excellent, it was crispy and flavorful. The sprouts added some additional interesting texture. The cheddar wasn’t particularly strong, but worked well as a background flavor. I don’t recall tasting the tomato at all, it was a pretty small slice though. The tuna itself was great. I’ve decided that I need to order more tuna sandwiches in the future. Finally it was time to make a decision about pie. I realized that it would probably be ridiculous to eat here ant not order pie. Anytime I see A Slice of Goodness mentioned anywhere it’s almost always due to the pie. I picked hot caramel apple. Of course this was hot and it was also served with ice cream, so instead of taking it I just had it there. I wasn’t in any hurry anyway. Now, I should say that I’m usually not crazy about apple pies. Mostly it’s the texture of apple slices which are still rubbery or have some sort of crunch to them still. This was not that at all. It was hard to recognize it as a slice of pie. The ice cream scoop was plopped right in the middle of a mass of crust, apple/caramel filling, and all drizzled with more caramel. THIS. WAS. AWESOME. Everything about it was great, the crust was brilliant, the ice cream delicious and not so soft that it would melt into a puddle and the apples pretty much melted in your mouth. I’ve heard it for years but I’m now convinced. Best pies around. I feel like A Slice of Goodness is a place many people have at least heard about but not tried and are curious about. I was one of those people for a long time, and now that I’ve been there I would say to the rest of you: “Go!” The only thing preventing 5 of 5 here was the soda.